A modern home in the midst of the scenic allure of Samui’s Choeng Mon beach, Villa Samui Sunset is a beautiful tropical paradise that not only allows you to enjoy a comfortable stay in a private villa but provides you easy access to beaches, restaurants and places of interest. The villa houses two bedrooms and a living area that have been designed with a mix of traditional and modern elements. From its charming outdoors to the spacious indoors, the villa offers something for everyone. 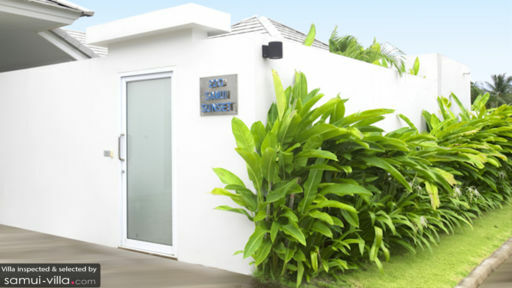 Perfect for a vacation with friends and family, Villa Samui Sunset will be the star of your upcoming holiday to Samui. The bright and cheerful bedrooms at Villa Samui Sunset are designed in a way that utilises the space in a most efficient way. You will find everything from king-sized and queen-sized beds to dressers and cabinets, additional seating and tropical-inspired, traditional décor. The luxurious and jewel-tone décor adds an opulence to the bedrooms. There are sliding doors that open either to the pool or verdant foliage. Each bedroom has an ensuite and the master bathroom has a double-size bath and shower whereas the second bathroom is fitted with a rain shower. The villa has been designed around the swimming pool with the open concept living areas and the bedrooms located poolside. There is a small garden and luscious plants that border the pool as well to make a refreshing area where guests can sunbathe, relax, read a book and enjoy some cocktails. Once the sun sets and the skies are streaked with golden hues, rest under the poolside sala with a glass of your favourite wine and spend quality time with your loved ones. The veranda is designed with an alfresco dining area for four where a hearty breakfast doesn’t sound like a bad idea. Located right beside the swimming pool, the glass doors of the living area reveal a beautiful view while you lounge on the comfortable sofas. The living area hints at traditional Thai design with beautiful artwork gracing the walls. There is a flat-screen TV and DVD player in place to serve as your entertainment when you are thinking of staying indoors. The room is air-conditioned giving you the option to choose from natural tropical breeze or the cool air-conditioner as per the weather outside. Also sharing space with the living area is the four-seater dining table that has been laid out perfectly to provide you wish a personal corner of the house where you can relish delicious food with the people you cherish. There is a fully-equipped kitchen with charcoal grey cabinets, granite countertops and modern appliances such as microwave/oven, induction cooktop and other facilities; a boon when you are travelling with kids. Guests of Villa Samui Sunset can avail the services offered by Horizon Estate including their fitness facilities. 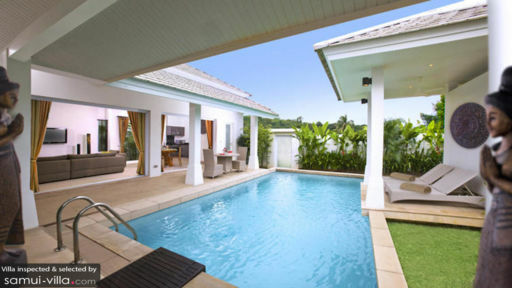 The villa is well-kept with housekeeping and maintenance looked after regularly. If you have rented a car then the villa even has a parking area to serve your needs. With so much to do around the villa, you will be spending time torn between staying indoors or roaming about the beaches in Samui. From fun water activities to exploring the food scene near Choeng Mon, there is plenty of action in this area. Big Buddha Bophut and Wat Plai Laem are two of the most visited sights in the region. There are many dining options available where you can taste local and fusion flavours such as Dining on the Rocks while enjoying a spectacular view.